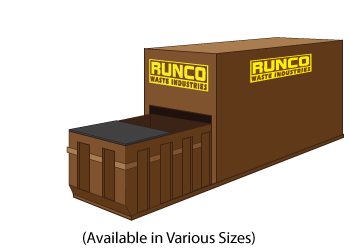 RUNCO Waste's small business compactor rental allows you to quickly find the right size compactor for your project and schedule delivery all in just a few clicks. This style compaction unit comes in a variety of sizes. Various uses include: apartment buildings, high-rise apartment buildings, office buildings, and light industrial waste. Our 42 Yard Compactors are the best solution when large volumes of dry, compactable materials are being generated and space is not a concern. Available for both solid waste or recyclable materials, we pick these containers up by roll off trucks when they’re full. This compactor is ideal for large volumes of compactable wet waste or when containing liquids and avoiding spills is a concern. 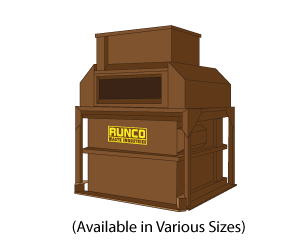 Self Contained Compactors are serviced by roll-off trucks, and the container and attached compactor are picked up when full to dispose of the waste. Our stationary Vertical Compactors feature a framework that can be anchored to concrete and a heavy-duty leak proof design. These are a great solution for restaurants, manufacturers, schools and strip malls.